I made this last night. I added 1/2 tsp of cayenne pepper with the shrimp and I used a 6oz bag of baby spinach. I skipped the cornstarch. Recipe turned out GREAT. This is a sensational recipe! My significant other picked this out on pinterest and sent it to me for an dinner ideas because I am always willing to try new things. This dish is delicious! The only thing I didnt do was add cornstarch to make the sauce thicker. I don’t have any use for cornstarch, so I didn’t want to buy solely for this meal. It was super easy and quick to make! Definitely will be saving and trying it again!! I’m so happy to read your comment Phedencia! Thank you so much for sharing. I’m so happy you liked it! Just amazing! Made it tonight and it was a hit! I made this tonight and wow it was so good. Thank you for sharing this recipe! Always looking for a reason to use sun dried tomatoes. I followed the recipe exactly except added mushrooms and served over bow tie pasta. It was excellent. I would like to try this with chicken as well. . I will definitely be making this again and sharing the recipe with family and friends! Made this tonight. Adding to my keepers board. I didn’t use the cornstarch but I think I will next time. 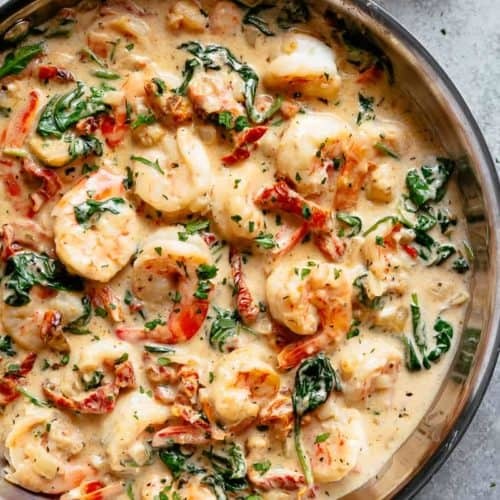 I just made this dish and as others have said, it was amazing… I have had a bag of frozen raw jumbo shrimp and have been looking for a good recipe to use them in and this definitely caught my eye. This is one recipe that had so many rave reviews I had to make it. I did alter the recipe a little and since we were not counting calories I added bacon and sliced portabella mushrooms!! I also split the 1 3/4 cup of half and half into 3/4 cup of milk and 3/4 cup half and half. I pre-cooked bacon(3/4 lb), which I cut into small pieces and drained the grease and removed into a separate bowl prior to cooking the onions, garlic, and mushrooms. I added the cooked bacon back into the pan just prior to adding the shrimp for the final simmer. This recipe is a keeper for sure and will continue to pass along to friends and family! Made this for my birthday dinner and it has become a new favorite. Made this for the first time the other day and it was absolutely delicious. Going forward this will be one of my go to meals. My girl friend is very much looking forward to having me make this dish ..ah, me too. Will let you know the outcome. Can’t believe that it won’t be GREAT!! Would it be sacrilicious to use fresh tomatoes instead of sundried if my wife does not like them? Even if someone doesn’t like the sun dried tomatoes, the flavor they add to this dish is phenomenal. In general, I don’t care for them either but this dish is top shelf!! 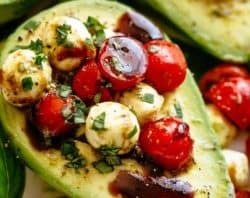 I did this with regular tomato and it was amazing more so for flavor:) I cut it up and when i sautéed with onion I kind of mashed the tomatoes to flatten you could say, it seemed to give more juice and was great! This is an excellent recipe! The favors are perfect and It is easy and quick to make. It just became my favorite shrimp dish ? I will certainly be making it often. Thank you for the recipe! I’m going to make this this week! I plan to add mushrooms though, and in just going to pour it over poached salmon, and then put mashed potatoes on the side! We often do shrimp and mushroom in garlic butter, which is what my husband requested this week. After a health scare, I am all about packing in veggies wherever I can, and I want us to have fish a couple times per week, so that’s why I chose your recipe. It adds tomatoes and spinach (and I dried my own tomatoes this year after roasting them on the smoker!). I’ll try to remember to come back and give you a review. Feel free to email me a reminder and stick me on your email list, I love the inspiration! I just finished making this fine crusine and it was DELICIOUS ?. My family really enjoyed this dinner. Thank you ? I’ve made this with shrimp as called for, with chicken, and I’m trying it with lobster tonight. It’s fabulous – hard to believe you can get this much flavor from scratch in so short a time. Thank you very much! I grow and freeze my spinach and yes it works just fine! This recipe was so delicious! I used cut up cherry tomatoes, spinach and mushrooms and it was so rich and yummy. I also used coconut milk only because its what I had on hand. This was so good. I loved it. I’ve made it 3 times now and today will be the fourth. It’s on my make list whenever shrimp is on sale. Thank you so much for this recipe. Can you tell me what ingredients are making this have so much sugar? 18 g is like two bowls of cereal. For any additional questions on nutrition I like to use myfitnesspal.com. Hope that helps! Hi, what can I use instead of white wine? I don’t want to use broth either bd size of the sodium. You are welcome to leave the white wine out or use chicken stock. Hope that helps and you enjoy your shrimp!! I substituted thick coconut milk for the half and half, and it was fantastic, giving it a nice flavor variation, but not overpowering in the least. Can I make this earlier In the afternoon and save it for dinner? Just keep it in the pot, reheat and mix over pasta when it’s dinner time? Looks amazing and can’t wait to make it! 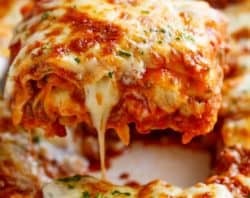 Would this recipe work without the cheese? We don’t eat cheese, but it looks so good, I would like to try it. I will also be using almond milk instead of heavy cream. Thanks! The cheese definitely helps with the texture and thickness. You will want to add something to replace that or unfortunately it wont be as creamy and delicious. You are welcome to try what is best for your family. With this dish though you don’t taste the cheese as much once it is all mixed together. Hello!! I seem to be having trouble finding the ingredients to this recipe. Help! This looks absolutely delicious! I would love to try this but I don’t see the recipe. OMG!!!! I don’t usually comment on ANYTHING, but I just had to for this recipe. I’m a pretty awful chef, but I seriously felt like I was at Olive Garden when I ate this. Its packed with flavor and is rediculously fast and easy to prepare! Icut up some cherry tomatoes instead of using sundried, subsituted cashew milk for the half/half, used kale instead of spinach because it’s what I had on hand and cut the recipe down by about 2/3 to serve just myself and everything came out amazing! I served it over some pasta and WOWZA I cant wait to make this again!! This is exactly the recipe I’ve bee looking for! I’m making it for dinner with Langostino and Shrimp together. I’ll use heavy cream with no wine or cornstarch and serve it over zucchini noodles to make it low-carb. Can’t wait to taste it! This was really yummy! I served it by itself, and it was so satisfying. Will definitely be making this again. I love that it’s quick and simple to make too. YAY!! That is great to hear! Thank you for sharing! OMG, made this tonight, it was delish! Hubby was off fishing, so I just prepped everything while he was gone, it pulled together in the 15 minutes as advertised (which I love). Full of flavour and texture! Will def be making this again! Hi Karina, I am fairly new to your website and have thoroughly enjoyed each recipe I have made. Thank you for your research and sharing the delicious recipes! OMG!!!!? THIS WAS AWESOME!!!! Sorry I get excited when I make a recipe and it’s successful. ? I’m not a good cooker and I get a bit skeptical? when trying things. However this came out great and my boyfriend loves it. We’re eating this at this moment. I think he’s going to subscribe me to this website?. I’m glad you gave substitute for things because I’m not big on half and half, but I love almond milk.? Now I have to cut this comment short(I had more to say) because I’m going in for seconds. ? SO happy to hear! I am so glad that you enjoyed these!! Thank you so much for the shares and following along with me! You made my day and I LOVED reading this! Thank you so much for this wonderful comment and for all your love and support! Whenever I make this dish the sauce lumps up once I add the cheese. I am wondering if I am doing something wrong? It is still tastey but not as thick and creamy and there are scattered lumps of cheese. Sometimes the temperature needs to be cooler if it is lumping up. The cheese needs to be stirred a little longer too. Hope that helps and you will enjoy your meal! Thanks for following along with me! We made this tonight for dinner. It is one of the tastiest dishes we’ve ever made and we’ve made a lot of great dishes. This will go in the FAVORITES category for sure. We served it over Angel Hair pasta. How many grams of carb if there was no wine or cornstarch used in the recipe? 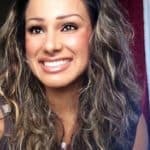 I like to use myfitnesspal.com or skinny taste.com to help answer any nutritional questions. Hope that helps and you are able to find your answers! Thanks so much for following along with me! Made this tonight and served over squash noodles. Didn’t thicken it. Absolutely delicious. Think I’ll use beef filet with brandy and Gorgonzola cheese instead of wine and Parmesan sometime. Thanks for the recipe! That sounds great! I am so glad that you liked it all. Thank you so much for following along with me and sharing! Glad that you liked it and that you made it your own! Thank you for sharing and following along with me! Cooked this the other night for my girlfriend and it was delicious. I substituted basil for the spinach and added tortellini pasta. My girlfriend loved it. That is a great idea! I love it! Thank you so much for sharing! I am so glad that you both loved it and you made it your own! Thanks so much for following along with me! Is arugula a good substitute for spinach? What a tasty recipe. Easy to follow and just a taste explosion in every bite! The only thing I did different is added Capers instead of salt. WOW! Thank you so much for an incredible description and comment! Thank you for following along with me and sharing! I am so glad that you enjoyed your meal! Hi Karina, I love this and many other of your recipes! I did have one question/request. Can you check the nutritional information? You’ve listed 16g of carbs, and 18g of sugars. Not sure that’s possible, and I like to track my macro nutrients. Thanks Karina!!! I like to use skinnytaste.com or myfitnesspal.com for any additional nutritional information. Hope you are able to find what you are looking for. Thanks so much for following along with me! OMG, this is fantastic! Husband still eats carbs, even he said just give me bowl of it next time!, don’t use cornstarch if on low carb, can use Xanthan Gum or arrowroot – but be careful, it does thicken pretty good on own. I am trying to cut carbs from my diet and noticed that this recipe has 16 grs. Is it primarily from the cornstarch ? How many carbs if I leave that out? Could I use Xanthan Gum instead? You are welcome to adapt the recipes into your own way that is best for you. I like to use myfitnesspal.com or skinnytaste.com for any nutritional information that you have. Hope that helps! Thanks so much for following along with me! So, started making this – and half way thru realized it called for half / half which I did not have and also did not have any milk in the house. It was too late to turn back, so I kept going without the half and half. It was STILL super delicious! So good. I made a this amazing recipe for dinner this evening and my husband and I loved it! This will definitely be added to the rotation. Thanks for the additional recipe suggestions!!! Also thanks for the nutritional information. Definitely subscribing! God Bless You!! I made this and it was fabulous but wondering how many servings are in the dish? I’m going keto and the sugars are high wondering if that’s from the sun dried tomatoes or wine??? Wine is high in sugars. I am not sure on the keto diet but I usually like to use myfitnesspal.com for nutritional information. I am so glad that you love this shrimp! Excellent shrimp dish and SUPER easy to make. I used wine and heavy cream and didn’t need the cornstarch. Everyone raved about it. I’ve made it several times and one guest said it was the best dish I’ve ever made and he eats here a lot and loves my cooking. Thanks for this! That is great to hear! Way to go! I am so glad that everyone loved it! Thanks so much for sharing! Just some feedback. This recipe is divine. It really is restaurant quality! We love garlic, so we tweaked it a little and added lots more garlic and onion. I used a better quality shrimp (Argentina Red), and oh my gosh., this shrimp is like eating lobster! Its hearty, and the taste and texture is that of lobster. I served it with angel hair pasta, drizzled w/salt and olive oil. I would recommend having all your ingredients prepared BEFORE cooking because it cooks in no time at all. You don’t want to over cook the shrimp because it will become rubbery. Really, 3 min each side, at the most, is what you should cook it; if that. I cooked only 1 1/2 min each side because it will continue to cook once you put it back with the hot and creamy sauce. You could even just leave the shrimp out after cooking and put it on top when you serve it. This is so versatile and can be tweaked just about any way. Add scallops, mmmm. Be warned, this is not a light meal, it is spicy, flavorful, and very rich. Thanks so much for this recipe! Thank You for a great recipe. Yes, I tweeked it, added buttermilk, mushrooms, and shaved parmesan it was fantastic! Thanks again! That sounds fantastic! I am so glad that you made it your own! Thanks so much for sharing! I made this for Valentine’s day and my man and I LOVED it! Did a serf and turf style and paired it in a small portion with some filet mignon ??? TO DIE FOR! Definitely reccomend! I used fat free half and half and it still came out perfect! That is one awesome Valentines Dinner! I love it! I am so glad that it tasted so good and you both enjoyed it! Thanks so much for sharing! Made this tonight for Ash Wednesday and Valentine’s dinner. Awesome taste and easy prep. I used heavy cream as I had it, definitely the wine and added a pinch of red pepper flakes per other comments. Served it over cauliflower rice as I am watching carbs. Simply delicious!! YUM! I love the cauliflower rice addition! Thanks so much for sharing! 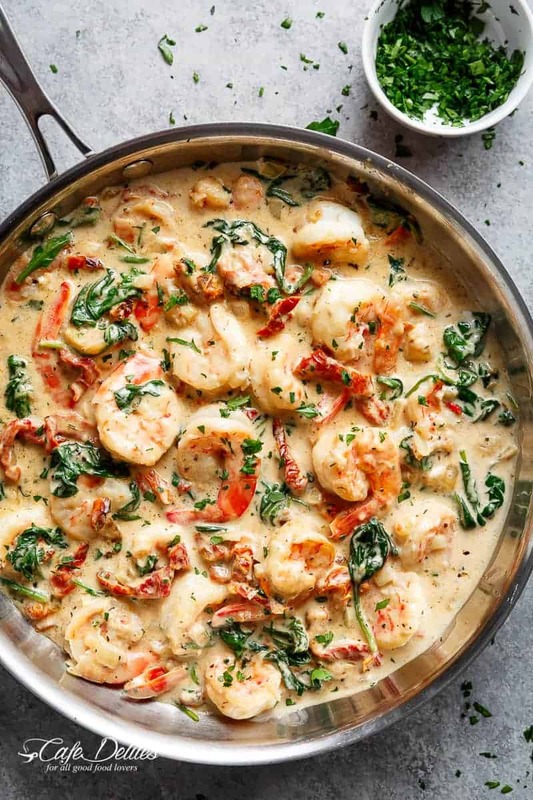 I’m a shrimp lover and never made a recipe like this…….Oh my God,Should be make over and over again,so tasty,yummmmyyy !!!Thanks.. That is awesome! I am so glad that you loved it so much! Keep making it;)!! Thanks for sharing! Yes, I would pre-boil or pre-cook the asparagus for a few minutes before putting it in. I am so glad that you love this recipe and that it works well with your set up. Thanks so much for sharing! Love this recipe. Have you ever tried it with rotisserie chicken in place of the shrimp? Curious if it would have the same consistency? You are always welcome to try any substitution on meat or any ingredient. There may be a variation in consistency but it can be glorious! Let me know how it turns out! Where does the reserved sun dried tomato oil fit in? This has to be the best website! The recipe is beyond awesome, and including wine pairings and nutritional info as well is amazing. Unfortunately i can’t have any fresh garlic, only powder, but it’s really delicious with it as well! WOW! Thank you so much! What a sweet comment to read! I really appreciate it! That is great to hear! I am bummed you can’t have fresh garlic but so glad there is the powder for you. Made this last night for my family, and everyone loved it! I used only half of the sun dried tomatoes, because I thought the kids wouldn’t like them so much, and it seemed like it was the perfect amount for us. Thanks for sharing your recipe! I look forward to trying more of yours! This was amazing! I used chicken instead of shrimp. Definitely a keeper. I can’t believe I actually made something that looked so beautiful. Thick you so much. Amazing!!! Restaurant quality!!! 2 of my picky teenage sons requested this to be made on their birthday dinners in the future so that is a tremendous compliment to you for this recipe! I served theirs over sausage tortellini and mine over cauliflower rice. Where are the 16g of carbs coming from? This IS so good, thought I was eating at a restraunt, but even better! I made this tonight, and it was AMAZING! I put it over zucchini noodles because I am trying to limit my pasta intake (I do like a couple gluten free ones!). Through on the Christmas music, and danced away in the kitchen. Super easy and soooo tasty! Yay Mindy! I’m so happy to read this, thank you. And Merry Christmas to you! Easy and delicious! More than 20 minutes though but well worth it and will make it again! Next time, I may add something to spice it up! If you are aware – just ignore me! Great shot by the way. Hi Meredith! No I wasn’t aware they are doing this. Thank you so much for bringing it to my attention though! I made this last week and it was delicious ! So easy. Didn’t have wine so i added a little broth instead. Hi Casie! Thank you for sharing that! Made this tonight with Half and Half and for some reason, the sauce started separating and producing little clumps. I did put a little heavy cream in to salvage the dish, it helped but the little clumps annoyed me. I should have just used heavy cream. The flavors were present and this is a great dish, next time I will just use heavy cream. ? Hmmm Gi did you have your heat on really high? Sometimes a rapid boil or high heat will cause this to happen. I’m so sorry that happened to you! Wow! This was sooooo delicious and seriously so easy. I am following a low card diet (right now, ha ha) so I skipped the corn starch and white wine and used heavy whipping cream. It was very rich so a small portion was very satisfying. I had it over zoodles, but I can only imagine it would be that much more delicious over linguine or mashed potatoes. Yum! I had it for lunch the next day and it was even better! I reheated it by adding about a tablespoon of cream and put it over zoodles again…but this time ate is more like a soup. Definitely making again! Would this work with chicken as well? Shrimp is expensive in Iowa! Made this last night and it was awesome! Love that it’s also gluten free. Will definitely make it again! I’ve made a variation of this for years, but I also like to add red pepper flakes, Italian seasoning, and stir in fresh or frozen whole green beans snd then serve over angel hair pasta. It’s a hit with my family who enjoys both shrimp and lemon; and you can’t beat what the spices and lemon do to the green beans as well! First time ever commenting on a pin and I’m a Pinterest Junkie and make dishes I find on here constantly . I made this tonight. Only change was I added cooked fettuccine to the sauce and didn’t add the thickening cornstarch. Other than that I didn’t change a thing. Holy Cow it was amazing! I could have easily paid over $25 for this at a good Italian spot. Thanks so much! Loved it! What is the actual serving size amount? I thought this was an absolutely delicious dish, as did my husband! I did use unsalted butter and added a little bit of salt after the half-and-half which was perfect. I also did not add the white wine or the cornstarch mixture. I’m sure they would have added to the taste, but I don’t think the dish suffered at all by omitting them. I served it over whole grain spaghetti. Would not hesitate to make this again. It would also be a very good meal to serve dinner guests. I’m looking forward to searching out more of your recipes. I made the Creamy Tuscan Shrimp recipe and it was delicious. As with most recipes I had to put my own spin on this dish. I added mushrooms, and a pinch of read pepper flakes. I also used heavy cream instead of half and half for extra creaminess. I used fresh linguine but next time I will try it with spaghetti squash. Hi, novice cook here.. 🙂 Stupid question: are dried italian herbs the same as Italian seasoning?? Hi Les! Yes! Same thing as Italian seasoning, sorry for the confusion! 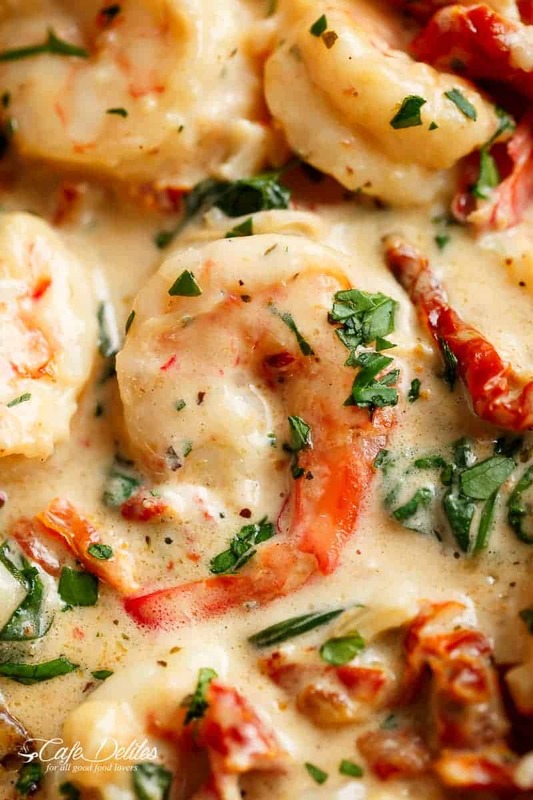 I would love to try the Creamy Garlic Tuscan Shrimp; it looks wonderful! How can I get permission to get a copy of the recipe? Thank you – found you on Stonegable’s blog site – trying this tonight. Wow, this was delicious! My whole family loved it, even my sometimes fussy children. Definitely making this again. I’ve made this twice. So yummy. The 2nd time I only had Super greens in my fridge. A mix of baby kale, baby chard, bsby arugula, baby spinach. And baby romaine from BJs. It worked great. I only use 1 clove of garlic and that is plenty. I don’t want to smell like garlic for days. Since I don’t eat bread, pasta or rice, I just kept adding liquid until it reached a chowder/soup consistency. Wonderful! The flavors are even better the next day. I made the Buttery Garlic Tuscan Shrimp for dinner today. It was delicious, and easy to make. This is a keeper! This was delicious. I will make this again. Thanks~! This recipe was so easy and it taste great. I will definitely make it again. This looks so, so delicious. It’s hard – even impossible – to beat the combination of shrimp and lots of garlic. I usually eat shrimp Asian-style so this recipe really intrigues me! This recipe was simply “wonderful!” Restaurant quality dish that was full of flavor. Followed your recipe exactly, except I mistakenly bought Fire Roasted Red Peppers (in jar/in oil), rather than the sun dried tomatoes, so I went ahead and used them. My bad, but the flavor was just scrumptious. I did use cornstarch to thicken sauce; made the sauce about the consistency of gravy. My dish looked EXACTLY like your Pinterest picture. Also, this is my “first ever” comment to any recipe I’ve tried off Pinterest. It was that good, I just had to say something. Thanks for the recipe. This was delicious! I added mushrooms with the onions and used heavy cream. Not sure what the intention was but I added the oil with the sundried tomatoes. It was so full of flavour! I served it over penne and everyone raved! Thanks for sharing!! Does anyone have any recommendations for white wine? I’m making the dish tonight for dinner and want to include the wine, but I have no idea what kind to buy. So so good! Didn’t have to change a thing! Served it over white rice and parents are excited for me to cook it again! My brother-in-law introduced me to this recipe, saying I needed to be more adventurous with my meals. I am a traditional meat-and-potato type of eater. I made this dish for my BP Guild potluck meeting last night. I used large scallops cut into bite-sized pieces instead of shrimp, and mixed with curly pasta. Response was favourable with some returning for seconds. I am NOT a seafood or pasta person but I really enjoyed this dish! I definitely will try again. Helen that’s amazing to read! Thank you for your feedback! Hi Brian. You can thaw the shrimp before beginning to cook; cook the sauce; then add the thawed shrimp at the very end and allow them to warm through the sauce. I can’t guarantee the flavour, but it should still work! Glad to hear that Caryn! I have made this recipe few times now. Love it! I substituted a pesto sun dried tomato blend. I serve it over white rice. Fancy enough for company. Made this tonight bnb y mother’s day dinner and omg…,so good! Didn’t change a thing…except I used heavy cream instead of half and half because “go big or go home” (it was also the only thing I had in the fridge). Thanks so mcluch for sharing this reciepe! This was amazing and easy to make. Thanks for sharing! This was not Valentines day. Not was it after a bubble bath with my sweetie. My husband is not a shrimp fan, but some of my kids are! My daughter found this recipe on Pinterest. We found ourselves without the other kids home and hubby with other dinner plans. So my lovely daughter and I decided on this on the way home, stopped for the things we didn’t have and completely enjoyed! Thank you! This is dinner tonight and I can’t wait for my family to enjoy this! Easily one of the best recipes I’ve used in years! Made this awesomely easy and yummy dish 3 times already and third time I cut some calories: butter I substituted for coconut oil refined, half-half – for almond milk, no starch, no wine. Sundried tomatoes was in oil but next time will try without. I was just same taste as with butter and 2% milk ( I used 2 other times). I made this tonight for dinner. It was stupendous. The only thing I did differently was add the Italian herbs just as the spinach started to wilt and blended them in so the sauce could take advantage of their flavors. (I also did not top with the parsley – not a parsley fan, I’m afraid, although it does help with the garlic breath!) My honey said “this is great – I feel like I am eating in a great restaurant! And to be honest, he would never order something like this. Cheese Ravioli with a marinara sauce is about as wild as he ever gets. I could have left out the cornstarch or thinned the sauce a bit, but it was decadent and flavorful and just lovely. I served it over fresh (store-bought) fettuccini which was just perfect to hold the sauce. Yum yum yum yum. Made this last night and it was excellent. I am just learning how to cook, but you could not have made it any easier for me. Threw it over linguine and it was gone in no time. Keep it coming. I like your suggestions about mushrooms and red pepper. I had never used sun dried tomatoes before — very oily, but they were great. We’re trying to avoid carbs so I had it alone (well, along with some brussels sprouts I baked) but my son would love this over pasta. OMG-good! This is a FANTASTIC dish that I could make for my family, myself or company. Thanks so much! Delicious! Four people devoured it with a pound of pasta. I will make this easy recipe again. Omgosh! This was so good that I had it for dinner over some broccoli and here I am 5 hours later having leftovers. I love mushrooms so I will be adding them next time. We are not fans of sun dried tomatoes so I just used grape tomatoes and they were yummy. We will add a dash of red pepper flakes for some kick next time. This recipe was so good that I can’t wait to make it again and now I’m sad that I have no leftovers for lunch tomorrow. Lol. Thanks for a really awesome recipe! Made this last week, per instructions…..You should have at least 10 stars to give this absolutely scrumptious…..couldn’t stop eating dish. Both hubby & I just moaned with delight from first fork full to the end. Will be making over and over again. 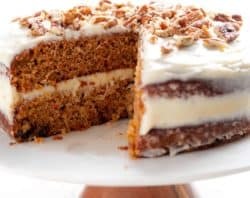 Thank you for this outstanding recipe…..
To cut fat/calories, try using evaporated skim milk or fat-free half-and-half. With the ff half-and-half, you may need to up the cornstarch 1 Tbsp, I have used both of these methods in the past for making alfredo sauce. No reason it wouldn’t rom here too. 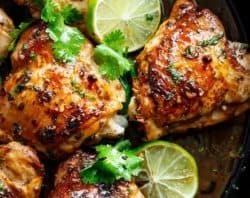 I just made your recipe for dinner, my husband and my daughter loved it! So easy and full of flavors. I served it with pasta. This was a hit!!! We loved everything about it. The sun-dried tomatoes were like little bonuses. I followed the recipe to the letter. My husband loves shrimp. You can’t imagine how many shrimp dishes we have in our monthly rotation. He’s a fan, so now this is a must! My only change next time would be to thicken my sauce. Thanks for sharing! HI Karina! Thank you for this, it looks amazing and I can’t imagine it with out grits I might add more cheese though to make the sauce a bit thicker. This will be dinner for tonight!! looks fabulous ! i will try it! This was hands down amazing. I left out the wine (only because i didn’t read the ingredients list properly ? However added a squeeze of lemon juice. Didn’t use shrimp, instead once the sauce came together I added a few basa fillets and let simmer through until cooked! Served over fettuccine egg noodles and have had a request from the partner to make it again! Made this delicious shrimp spinach goodness tonight, and omg so good! 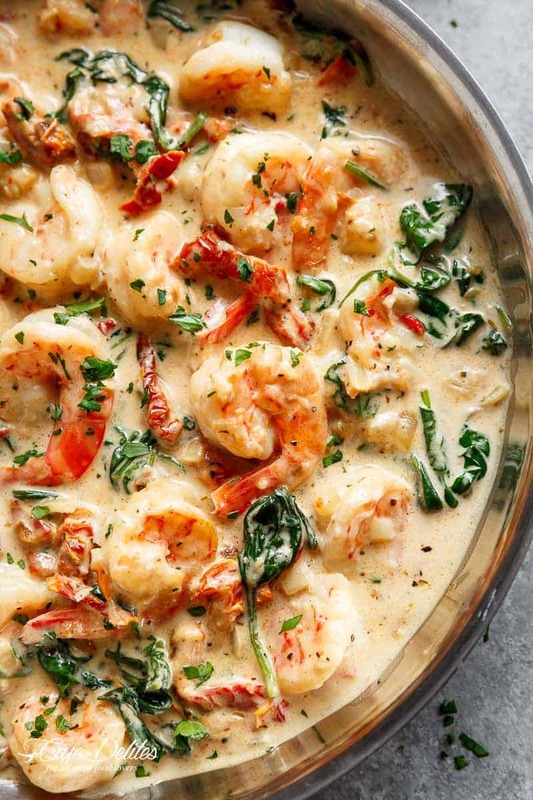 My husband usually isn’t big on shrimp but loves spinach and we both absolutely love garlic….I mean really is there ever too much garlic in anything? Along with the jared roasted tomatoes, it’s added to the top of my list of favorite go to dishes. This dish was delicious! Recipe is a keeper. Made this a couple nights ago. Superb made as written. Hubby moaned and groaned thru dinner. Will make again and again. Tx for this wonderful recipe. I’d gladly give it 10 stars were it possible. I’m going to make it this weekend but substituting langostinos for the shrimp and going to serve it over polenta. I have a feeling it will be a big hit! YUM Carmie!!! Sounds incredible with langostinos! AND polenta?! YES!!! Calorie intake please and thank you. Recipe sounds wonderful just watching calorie intake.. I was knew I’d love it but was skeptical whether my husband would (he doesn’t care for cream sauces). He loved it. We’re having company this weekend and they’ll be treated to this delightful dish since it is so quick and easy to prepare. Thank you so much for sharing it. Wow! This one is a keeper. I served it over rice, which was good. Next time I will serve it over angel hair pasta. I just made this Tuscan shrimp dish tonight. I don’t eat shrimp, but my son is a diehard fan. I made it for him because he doesn’t eat meat. I made this dish without taste-testing. My son loves it! He said, “How did you do that ,Mommy?” He is amazed how I can make a dish so delicious without being able to taste it. Thanks, Karina! Love love loove the recipe! I made this creamy garlic butter shrimp for my neighbors and they all wanted the recipe. I proudly told them where I got it from and printed out copies for them. It was a hit again. Will try the chicken over the weekend ? Just made this and it is absolutely delicious!!!!! Quick and easy and I usually already have most ingredients on-hand. Thank you for this! Hi Nina! You’re very welcome! I’m so glad you liked it! Are you using frozen shrimp? Or fresh? I have frozen, wondering if I need to thaw. O M G O M G O M G !!! Made exact recipe, but added a few scallops I had on hand. Never tasted anything like this in my life. And so simple. Thank you for this! I’m a horrible cook, and this recipe will fool anyone!!! Thank you for the inspiration Karina, as this is a great dish. I varied it some mainly using shallots instead of onion and pecorino Romano instead of parmesan. Also, I included white wine, which I think made a worthwhile difference. Made it exactly as suggested & added mushrooms in with the onions, serves over pasta- delicious and my SO kept going a k for more. Can’t wait to make again. Now a comment about the site. I’m an old fart and the light grey font is very hard to read. How bout just black? it’s not like you are paying for ink. I just cooked this tonight- SO good! I opted to add the white wine, which added great flavor, and added the corn starch mixture. It was pretty creamy already though because I let it simmer for maybe 10 mins. I also threw in some mushrooms which worked perfectly! I put it over angel hair pasta but next time I’ll try zucchini noodles (because there’s no way I’m subbing out that creaminess). This was such a great recipe! My family loved it. The flavors were so diverse yet not overwhelming. My girlfriend loved this, as did I. In place of sautéing the shrimp with garlic and butter, we used lite white rum and flambéed the shrimp to a pleasant crunch. Afterward, we added the butter and garlic to absorb the leftover flavors. Also we added heavy cream in place of half and half to up the decadance and a kale and spinach blend, a few capers, and olives for added complexity. I’ve made this dish myself to try before serving her and was blown away at how great this recipe is on its own. I definitely reccomened serving this with seasoned garlic bread or pasta if calories aren’t a big concern. I will share this with my family and friends that may othwrwise miss out on such a great meal. Oh my goodness! This was our dinner last night and it is AMAZING! I follow THM, so I subbed a dash of gluccie for the cornstarch and it was just fabulous! It will definitely go into the “favorites” category. Thank you for sharing this simple, but elegant recipe! Great recipe I put in some red pepper flakes also. Can you do it with fresh tomatoes instead of sun dried? Do you think that will mess it up? My fiancé has a shrimp allergy (breaks my shrimp loving heart), can I substitute chicken instead? And if so, what should I do differently so the sauce has the same consistency? Thanks!!! 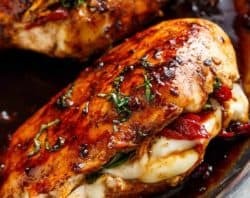 I made this recipe tonight for the family and it was amazing! I made a few changes such as, I didn’t use the sun dried tomatoes, white wine, or Italian seasoning. I substituted the shrimp for chicken (my kids don’t really do seafood), used heavy cream, and added bacon. Everybody went back for seconds, great recipe!!! I want to try this recipe but where or how can i get sun dried tomato strips in oil ? This was absolutely delicious! Do you happen to have the nutritional values? In particular, the carb count? Thank you for a fabulous recipe…we will definitely be making this again! Made this a few nights ago and it was fantastic. big hits with our young boys as well as the adults. I opted to use heavy whipping cream rather than half & half (as I had some in the fridge I needed to get rid of, and I’ often fond of extra creamy anyway). Would recommend sticking with the half & half, a bit too thick with my substitution. Amazing and easy meal sure to please just about anyone! I made this last night and served it over angel hair pasta. It was so delicious! I don’t usually care for seafood, but this recipe is a keeper. Thanks for sharing. I’m just learning low carb, this looks awesome. Could I use it in my low carb diet? Wow! I made this with a few substitutions to make it more ketogenic friendly and served over zoodles. My non-keto Husband devoured it! We will have this again for sure! Made the garlic creamy butter shrimp last night and my guests loved it. Karina, thank you so much. Just made this recipe for lunch and served it with spaghetti noodles mixed in and even my somewhat picky husband liked it. Sun dried tomatoes and all. Two thumbs up. Can’t wait to try another recipe. I’ve tried to make a white wine lemon cream sauce to go over shrimp but I can’t ever get it right. I know you have to use all fat milk to keep it from curdling. Any idea how to incorporate white wine and lemon into this? What kind of pasta do you suggest? How many carbs are in this, Im new to low carb, trying to learn what to and not to eat,from what I see this shouldn’t be too bad. Would love to try it if it isn’t too high in carbs. I made this recipe without changing anything. I did not have to add the corn starch the sauce was a perfect consistency without it. 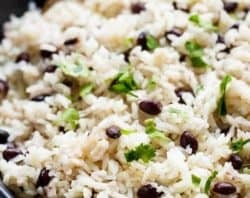 The entire family loved this dish I served it over brown rice and it was a hit. Next time I’m going to try it over pasta. I think you could serve it over just about anything and it would still taste fabulous. Great recipe!! Thank you so much! Hi Kathy! You’re so welcome! I’m happy to hear that. Thank you for coming back to share your feedback! Enjoy your weekend! Wonderful dish. Made exactly as written, except I didn’t need the cornstarch as the sauce was a perfect consistency. My husband loved it and said to look for more recipes on your site. Delicious-looking recipe – I definitely plan to make it. However, I will substitute Coconut Cream for the Half and Half to make it a little healthier. I have to go to a local International Market to find it or go online to purchase it. This was fantastic! Followed the recipe word for word and my very picky family loved it! Also saw it on Facebook and loved the video. It made me want to try it straight away. Your so talented Karina and your photos rock! Do you think that I could use a broth instead of half & half and then just add a splash of cream to make it creamier without all the fat? I have been making Tuscan, shrimp and chicken for years. This recipe is perfect. If I can, add 1 thing. I add Black olives to mine and then add the juice in the sauce. I also will use Condensed milk like I do with Gravy as it adds a creaminess that unbelievable. Jim that sounds incredible! Thank you for your suggestions! I’m allergic to spinach. What could I substitute, or do I just leave it out? My husband isn’t the shrimp lover that I am. Made this last night and added mushrooms. He finished every last bite and said, “I think that was the most delicious shrimp dish I’ve ever had!” Woohoo! Thank you! I’m making another one of your dishes tonight! Yay Karen that’s so awesome!!! ? You never disappoint me with your creations. Made this for my sister and brother in law. He had a major stroke so she works a LOT. Wanted to surprise them with a lovely meal and love and behold…..you did it again. She was thrilled to come home to “Sorella Bar” Sister Cafe in Italian. They both loved it. Thank you. And YES I’ve missed you. We had this for dinner this evening and it was much enjoyed. I made a couple of changes – didn’t have any cream so added coconut milk. A stick of celery that was lurking in the fridge along with a couple of tomatoes were added, didn’t bother with the cornflour because by leaving it to bubble away before adding the shrimps/prawns back in helped to make it nice and creamy and I was serving it over quinoa. This will appear on the menu again. It was very subtle in flavour and a really nice recipe. Thankyou! This was like something out of a restaurant but better! My boyfriend said if I promise cook this for him every week, he’ll propose lolll! Thank you Karina! I made this for dinner last night and it was absolutely divine! The recipe instructions were easy to follow and I wasn’t in the kitchen forwver, which is a huge plus! This will definitely be in my regular meal rotation. Thanks so much for sharing! Karina, you’re an amazing lady and I would also like to commend your husband for his support and sacrifice along with your children and familia! Keep praying and keep working out, especially with recipes and musica ! Thank you y Adios! Just wanted to send my love from Pittsburgh, PA for Valentine’s day! Your recipes have changed my life, and I just want to thank you from the bottom of my heart for you inspiration! I can’t wait to try this recipe! Danielle thank you! What a sweet message to read first thing in the morning! Thank you so much! I hope you like this one. It’s absolutely delicious! Hi There beautiful looking lady! Married man of 42 years to a wonderful beautiful wife, Cecilia! Thank you for sharing your cooking with us! I’m a beginner and gave used three menus which my wife loved! She’s a big time quilter so i’m helping with some cooking. We love sea food, steack and ITALIAN, besides others and also enjoy our wine with the meals. I’m gonna try the creamy garlic shrimp, she doesn’t want to overload with garlic. Any suggestions? Your sight is Cafe Delites, but I don’t see any calorie counts. This stuff looks way to delicious to be light. Just wondering?? Hi Bridget. Unfortunately some brands have trace amounts of gluten during the manufacturing process, and readers that are gluten intolerant have pointed this out to me. Thank you for your suggestion! I have to try this shrimp dish. I am wondering about the dried Italian herbs. What herbs did you use, there are so many.